Here's the data and the motivational chart you needed for voice therapy.....This is a chart to keep daily data on vocal abuse/misuse. The kids can color in progress every day. See the color ratings below. 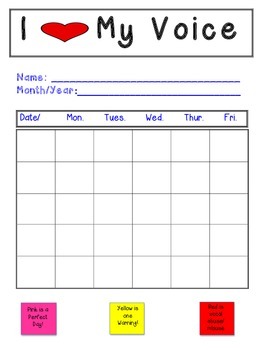 Write the month and year on top and dates on the sides. This is so motivational for the kids to see their progress.